You are currently browsing the tag archive for the ‘Brunch Recipe’ tag. Cut pastry into 9 – 3 ½” squares. Place squares flat on parchment paper on cookie sheet. Put a chunk of chocolate on each square. Brush 2 sides of pastry with egg. Fold over pastry to form triangle over chocolate. Use your fingers to gently press edges together. Place baking sheet in the freezer until thoroughly chilled. Brush top with remaining egg then bake. This is a breakfast winner! It’s healthy, hearty and tastes fantastic! The toasted seeds really give it a yummy crunch! In a dry skillet on medium heat, roast Pumpkin Seeds and Sunflower Seeds for three minutes stirring constantly. Add Sesame Seeds and cook for another couple of minutes stirring until they are all evenly browned. Cool. Remove white pith from the oranges and cut into bite size pieces. Slice bananas and gently toss with oranges, add yogurt and gently combine. Divide into four dishes, top with the fig mixture then the seed mixture, and then decorate with the rind. Do you ever have company staying with you – and you know you aren’t going to get much sleep? And you know that you’re going to want to have a great breakfast in the morning, but you won’t want to get up early or have to think too hard to put it together? I have found a recipe that delights guests and requires no thinking or effort the morning of. I’m calling it Berry Creamy French Toast. 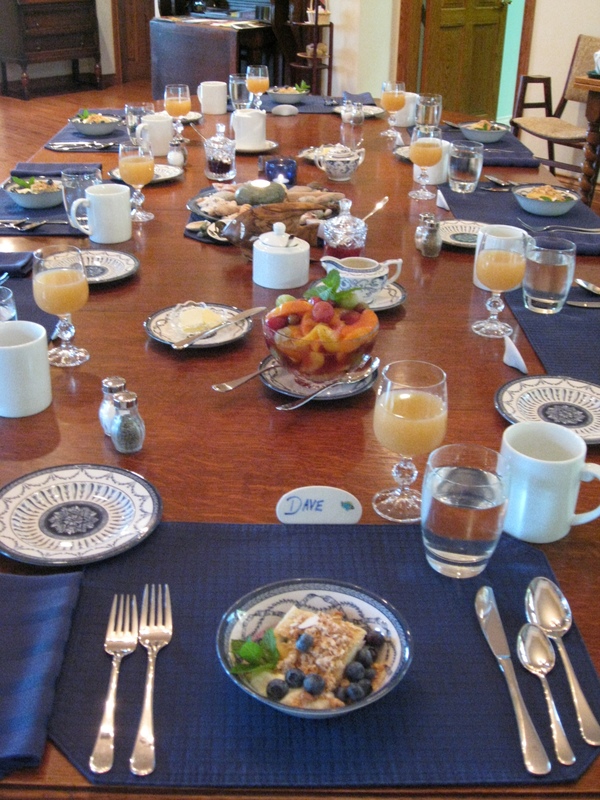 It was inspired by a Victoria, BC cookbook called “Fabulous Fairholme Breakfasts & Brunches” by Sylvia Main. 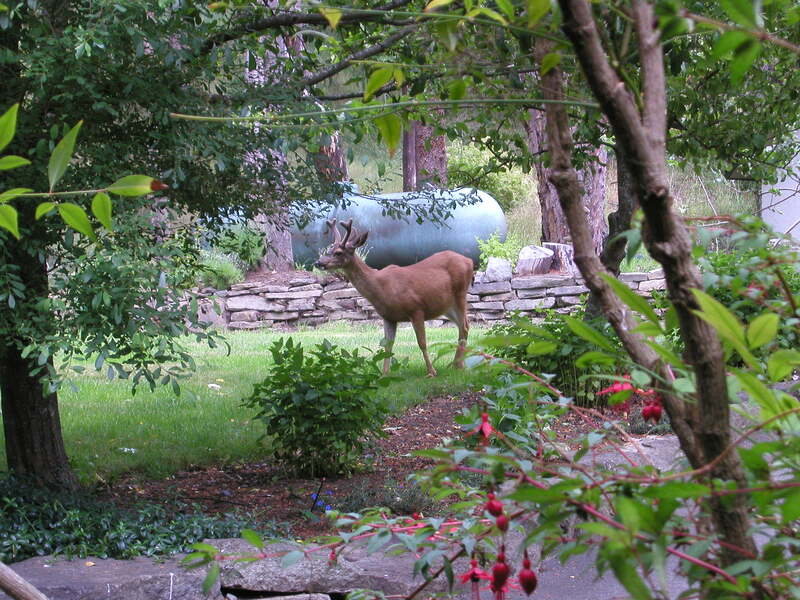 My husband Dave and I have been spending most of our time on Salt Spring Island filling up one of Mom and Dad’s B&B rooms – and we had a couple of friends over for the weekend! We wanted to treat them to a B&B special breakfast but the morning was going to be a bit hectic and likely, sleep deprived. So, Friday night, while I was waiting for them to arrive, I threw this together. It took me about 15 minutes … and I think that it was a big hit! We’ve got the empty dishes to prove it. Grease 6 inch ramekins (or large muffin tins). Line the bottom of each with cubes of bread. Spread a layer of fruit on top of the bread. Cover the fruit with cubes of cream cheese. Cover the cream cheese with another layer of bread. In a medium bowl, whisk together eggs, milk, and syrup. Pour the mixture over the bread in each dish. Place in fridge overnight and uncovered. IN THE MORNING: Bake at 350oF for 50 – 60 minutes, or until they become puffy and golden. Remove from the oven, and serve with berry compote on the side. We also served it with a turkey sausage. In a large saucepan bring 2 cups of frozen berries, 2 tablespoons of cornstarch, 1 teaspoon of lime juice and 2 tablespoons of maple syrup to a boil. Turn the heat down and then stir every 30 seconds or so until the sauce starts to thicken. 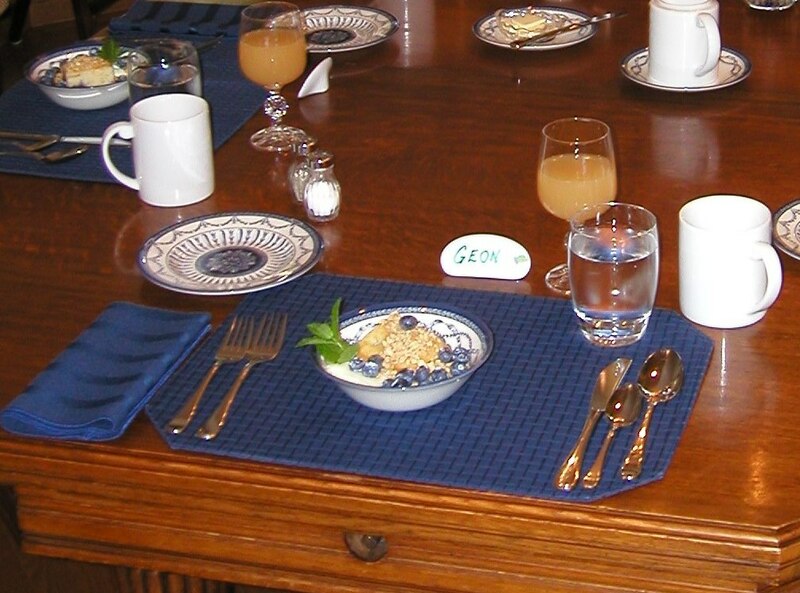 Breakfast was a success - the proof is in the empty dishes! In 4 serving dishes, sprinkle 1/4 cup of granola per dish. Top with 1/4 cup of yogurt. Repeat, sprinkling 1/4 cup of granola on top of the yogurt and then 1/4 cup of yogurt on top of the granola, yogurt, granola layers. Place one pear half (indent down, round side up) in each dish. Drizzle 1 Tablespoon raspberry syrup over the mixture and sprinkle with almonds. Get Free Brunch and Breakfast Recipes Weekly! Christmas Dinner Leftover Idea – Use the Mashed Potatoes for Brunch! My Dad goes crazy for mashed potatoes. Actually, potatoes in general. 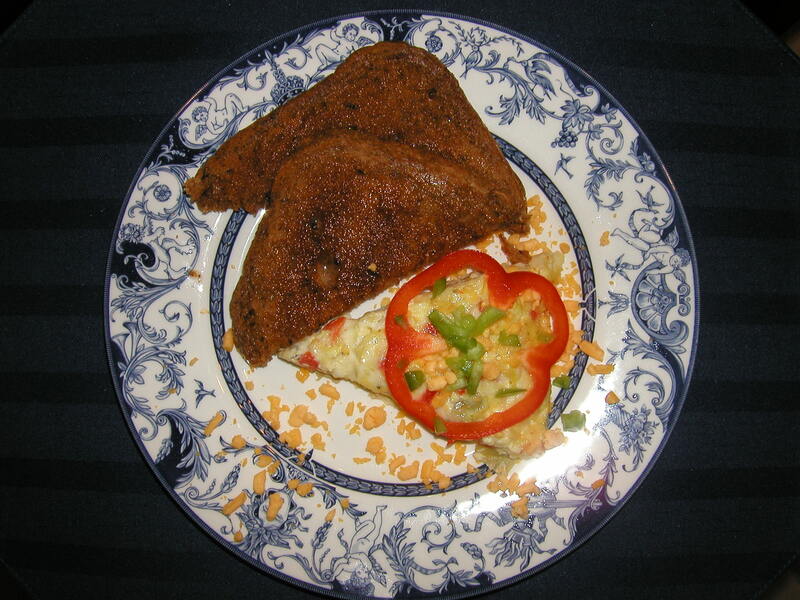 And this recipe was a creation of his that he served to some of their Bed and Breakfast guests. He prefers to just fry up his potatoes and eat them golden brown with ketchup, but I really like this simple little bake in the oven recipe for using left over mashed potatoes! If potatoes are cold, heat in microwave until they are heated right through the center. In a large bowl mix together potatoes, bacon, onions and ½ cup cheddar cheese and salt and pepper. Press 1 cup of mix in each boat (a 5 inch oven proof oval dish). Press a well in the center to hold egg. Crack egg and pour into center. Sprinkle each boat with a liberal amount of cheddar cheese & green onion. Bake 20-25 minutes until egg is cooked. Sprinkle remainder of cheese and top with 2 chive sprigs. This week’s e-mail recipe is a great addition to an everyday breakfast menu, or a lovely way to start off a Sunday Brunch. Just be sure to get things ready in advance – this one needs at least an hour of refrigeration before you serve it. 1. In a bowl, pour apple juice over the rolled oats. Cover and refrigerate overnight (or at least 1 hour). 2. 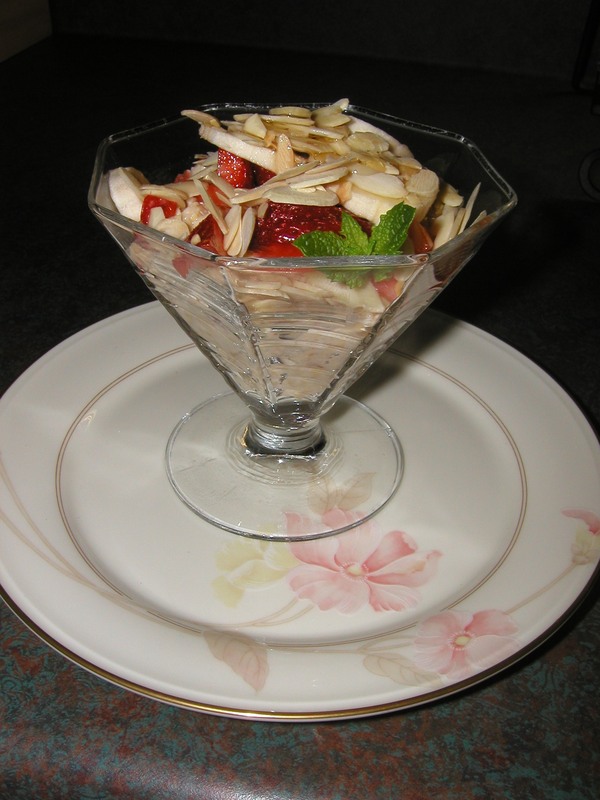 Stir in grated apple, french vanilla yogurt and lemon juice and spoon into individual bowls. 3. Top with banana, strawberries, cranberries, almonds and drizzle with honey.